This article is about the 2003 Fire in San Diego County. For the 2016 fire in Kern County, see Cedar Fire (2016). The Cedar Fire was a massive wildfire which burned 273,246 acres (1,106 km2) of land in San Diego County, California, during October and November 2003. The fire's rapid growth was driven by the Santa Ana winds, causing the fire to spread at a rate of 3,600 acres (15 km2) per hour. By the time the fire was fully contained on November 4, it had destroyed 2,820 buildings (including 2,232 homes) and killed 15 people, including one firefighter. Hotspots continued to burn within the Cedar Fire's perimeter until December 5, 2003. A dozen simultaneous wildfires in October 2003; the Cedar Fire is the group of large red dots right of center. The fire remains one of the largest wildfires in California history and, as of 2018, the third-largest wildfire in the state's modern history. According to CALFIRE, it is also the third deadliest and fourth most destructive wildfire in state history, causing just over $1.3 billion in damages. In November 2018, the Camp Fire (2018) surpassed the Tubbs Fire (which had previously surpassed the 1991 Oakland Firestorm and the Cedar Fire) to become the single most destructive wildfire in California history, in terms of the number of buildings destroyed. In December 2017, the Thomas Fire surpassed the Cedar Fire to become California's largest modern wildfire on record, before the Mendocino Complex Fire's Ranch Fire surpassed both fires to become the state's largest wildfire in August 2018. The Cedar Fire began in the Cuyamaca Mountains within the Cleveland National Forest. It was first reported at 5:37 PM PDT on October 25, 2003, to the south of Ramona in central San Diego County. 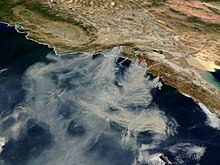 At the time it began, at least eleven other wildfires were actively burning in Southern California. Within ten minutes of the initial report, the U.S. Forest Service had deployed 10 fire engines, two water tenders, two hand crews and two chief officers. Within 30 minutes, 320 firefighters and six fire chiefs were en route. A San Diego County Sheriff's Department ASTREA helicopter that was rescuing a hunter spotted the fire at about the same time as the first phone report was received and called for an air response. Another Sheriff's helicopter equipped with a Bambi bucket was dispatched to drop water on the fire. When the helicopter was only minutes away from the fire, a Forest Service fire chief cancelled the water drop because policy required the cutoff of aerial firefighting 30 minutes before sunset. Between the time the fire started and midnight the predicted strong easterly Santa Ana winds surfaced and the fire burned approximately 5,319 acres. By 3:00 AM, 62,000 acres (250 km2) had burned. Overnight, the fast-moving fire killed 12 people living in Wildcat Canyon and Muth Valley in the northern part of Lakeside, who had little or no warning that the fire was approaching. The fire destroyed 39 homes on the Barona Indian Reservation. In only a few hours, the Cedar Fire pushed southwest over 30 miles (48.3 km) and burned over 100,000 acres (400 km2) at rates of up to 6,000 acres (24 km2) per hour. The fire also crossed several large highways, including Interstate 15, and by noon on October 26, the fire was burning hundreds of homes in the Scripps Ranch community of San Diego, and was threatening many others. On October 26, the fire forged into Alpine, Harbison Canyon, Lake Jennings and Crest, burning hundreds more homes in areas that had been devastated by the Laguna Fire 33 years earlier. By October 28, the strong easterly Santa Ana winds died down and the fire turned east, consuming another 114,000 acres (460 km2). The entire community of Cuyamaca, most of nearby Cuyamaca Rancho State Park, and more than 500 homes surrounding the town of Julian were destroyed. On October 29, a group of firefighters attempting to defend a house in Riverwood Estates, near Santa Ysabel, became entrapped and overrun by the fire. One firefighter died. Another firefighter sustained severe injuries, and two others were hurt. Firefighters finally achieved full containment of the Cedar Fire on November 3, and the Cedar Fire was completely brought under control on December 5. In the wake of the 2003 firestorm, including the Cedar Fire, California Governor Arnold Schwarzenegger (Gray Davis was still governor) declared a state of emergency and activated the National Guard to assist in the disaster relief process. President George W. Bush declared Los Angeles, San Bernardino, San Diego and Ventura counties major disaster areas. Air travel in and around the region was also disrupted due to the effect on air traffic control radar. San Diego's Qualcomm Stadium was used as an evacuation site, forcing the NFL to move the Monday Night Football game on October 27 between the San Diego Chargers and Miami Dolphins to Sun Devil Stadium in Tempe, Arizona. The decision to move the game to Arizona was made less than 24 hours before the game started, and admission was free. Investigators determined that the fire was started by Sergio Martinez of West Covina, California, a novice hunter who had been hunting in the area and had become lost. Martinez initially told investigators that he had fired a shot from his rifle to draw attention and that the shot had caused the fire, but he later recanted and admitted he started the fire intentionally to signal rescuers. After gathering sticks and brush together, Martinez lit the brush and quickly lost control of the fire because of the heat, low humidity and low moisture content of the surrounding vegetation. Martinez was charged in federal court on October 7, 2004 with setting the fire and lying about it. In November 2005, a federal judge sentenced Martinez to six months in a work-furlough program and ordered him to complete 960 hours (40 days) of community service. He also was sentenced to five years' probation and to pay $9,000 in restitution. As part of the plea bargain, prosecutors dropped the charge of lying to investigators. There were a number of controversies associated with the Cedar Fire, resulting in investigations lasting several years. A report, the 2003 San Diego County Fire Siege Fire Safety Review, prepared in the wake of the fire and presented to the Governor's Blue Ribbon Fire Commission, criticized the overall response. The report stated that though the fire conditions and severity should have been expected, the responsible agencies were not properly prepared when the fire broke out, and radio communications problems exacerbated the problem. The report stated that "Disorganization, inconsistent or outdated policies among agencies that grounded aircraft or caused other problems, and planning or logistics in disarray also marked the preliminary stages of the difficult, dangerous firefighting." With multiple fires already burning in the state, many local crews were already headed north to fight other fires and could not be recalled to assist with the Cedar Fire. The turning away of the Sheriff's helicopters by the U.S. Forest Service in the fire's early stages came under severe criticism by the public, media and elected officials, believing that an opportunity to prevent the fire from becoming out of control had been lost. The federal government has an aviation assets "cutoff" policy which stated that "aircraft (planes or helicopters) may not be dispatched so as to arrive at an incident no later than 30 minutes before sunset". The helicopter pilot later claimed he could have made multiple water drops in the time he had before darkness. However, a study conducted by the Forest Service concluded that even if the helicopter had been able to drop multiple loads of water with direct hits on the flames, the impact on the fire would have been minimal. Cutoff also prevented two air tankers and a helicopter stationed at Ramona Airport from being dispatched to the fire, although the tankers likely could not have been used anyway as the pilots had just spent seven hours fighting another fire, and FAA regulations stipulated that they could not continue to fly. A contributing factor to the initial lack of aviation resources to fight the fire was the California Department of Forestry's "no divert" policy, which allows incident commanders to dedicate certain resources to a particular fire; the policy applied to both airborne aircraft as well as those on the ground awaiting dispatch. At the time that the Cedar Fire started, there were already 11 other fires burning in the region. Aviation resources in the area were currently being held on the ground under a "no divert" declaration, in order to be available for structures' protection on another fire. However, weather and visibility at the other fire was precluding their use, so the aircraft sat idle, despite the fact that conditions were acceptable for their use on the Cedar Fire. Both the media and local elected officials were also critical of the lack of use of military aviation assets located nearby at Camp Pendleton and Miramar. The U.S. Marine Corps operates CH-46 Sea Knight and CH-53 Sea Stallion helicopters that can carry water-dropping buckets, but existing policies prohibited their use until all other civilian resources were used. Additionally, the military aircraft radios were not compatible with those used by most state and local fire agencies, and the military pilots had not received any training in fire-specific operations, making them a potential safety hazard both to firefighters on the ground and other aircraft over the fire. Fifteen people, including one firefighter, were killed by the fire. A survivor, Rudy Reyes, was burned over approximately 70 percent of his body. Many of those killed were trapped by the flames which were driven by 60-mile-per-hour (97 km/h) winds that propelled the flames faster than residents could flee. Of those killed, 13 died in the first 24 hours of the fire. At least 10 people were trapped in their vehicles trying to outrun the flames. Some of those killed were so badly burned their remains were identified based on the dog tags of pets lying dead near them. On October 29, fire overran an engine crew from the Novato Fire District near the town of Julian. Engineer Steven Rucker sustained fatal injuries, while the three other members of the crew were able to take shelter in a house. ^ a b c d e f "Cedar Fire Memorial". www.lakesidehistory.org. Archived from the original on 23 June 2016. Retrieved 5 September 2016. ^ "Cedar Fire". CALFIRE. Retrieved 5 September 2016. ^ "Top 20 Largest California Wildfires" (PDF). CALFIRE. Retrieved 5 September 2016. ^ "Top 20 Deadliest California Wildfires" (PDF). CALFIRE. Retrieved 5 September 2016. ^ "Top 20 Most Damaging California Destructive Wildfires" (PDF). CALFIRE. Retrieved 5 September 2016. ^ California Department of Forestry and Fire Protection. "Top 20 CalFire" (PDF). Retrieved August 8, 2018. ^ "Cedar Fire - After Action Report" (PDF). San Diego.gov. Retrieved 5 September 2016. ^ a b Dotinga, Randy (4 November 2003). "California's search for wildfire solutions". Christian Science Monitor. Retrieved 5 September 2016. ^ a b Bowles, Scott (30 October 2003). "Hesitation is a fatal mistake as Calif. firestorm closes in". USA Today. Retrieved 5 September 2016. ^ "Colorado Firecamp - Cedar Fire, CDF Report, Summary of Events". www.coloradofirecamp.com. Retrieved 5 September 2016. ^ Andrews, John (1 November 2003). "California wildfires raise social questions - World Socialist Web Site". www.wsws.org. World Socialist Web Site. Retrieved 5 September 2016. ^ "NFL.com - NFL News". 26 October 2003. Archived from the original on 14 October 2006. Retrieved 3 January 2017. ^ Zamora, Jim Herron (29 October 2003). "Arson suspected in most of 10 fires / 2 men set Old Fire, witnesses say". SF Gate. Retrieved 5 September 2016. ^ Soto, Onell (2 February 2005). "Cedar fire suspect feared he would die". The San Diego Union-Tribune. Retrieved 5 September 2016. ^ a b Perry, Tony (18 November 2005). "35-Year-Old Sentenced in Deadly Cedar Fire". Los Angeles Times. Retrieved 5 September 2016. ^ "Interagency Standards for Fire and Aviation Operations 2007, Chapter 17" (PDF). National Interagency Fire Center. 2007. p. 10. Archived from the original (PDF) on 2007-09-28. Retrieved 2007-08-31. ^ Roger Hedgecock and the Cedar fire - The California Chaparral Institute - including a San Diego Union-Tribune article from April 6, 2006 and comments from the following day's San Diego AM Roger Hedgecock show - Obtained August 31, 2007. ^ Raftery, Miriam (October 27, 2013). "Flames that scorched community 10 years ago have forged strength in survivors, though scars remain". East County Magazine. ^ a b Madigan, Nick (29 October 2003). "Cars Became Coffins for 10 Trying to Flee". The New York Times. Retrieved 6 September 2016. ^ Squatriglia, Chuck (13 November 2003). "Firefighter hailed from near and far / 1,500 cohorts attend Steve Rucker's San Rafael memorial". SF Gate. Retrieved 5 September 2016. ^ "Cedar Fire, CDF Report, Overview". www.coloradofirecamp.com. Colorado Firecamp. Retrieved 3 January 2017.